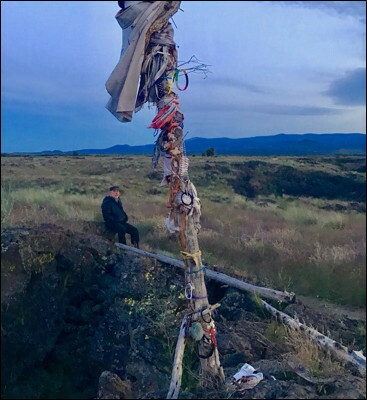 Dusk at the prayer and offering pole at Captain Jack's Stronghold near Tule Lake, site of the 1870s Modoc War. As daylight fades, light grows in the east with the rising of the full moon. As the atrocities of the war become memories, offerings to acknowledge those memories and honor those who suffered, find their way into the pole that nightly reaches higher into the sky.